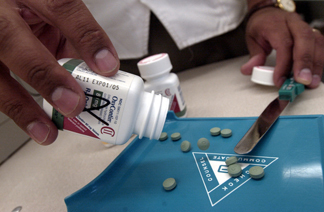 An 82-year-old Los Angeles physician allegedly wrote multiple prescriptions for the maximum amount of oxycodone permitted by law to a ring of street dealers who would resell the pills, along with anti-anxiety medicine, muscle relaxants and prescription cough syrup. According to the District Attorney’s Office, Dr. Clyde Arnold, who was indicted along with alleged co-conspirators, pleaded not guilty Friday to 31 felony counts, including 27 counts of prescribing without a legitimate medical purpose and four counts of conspiracy. • All five co-defendants also pleaded not guilty. Arnold was arrested Oct. 15 and posted bail three days later. He was ordered by Los Angeles Superior Court Judge Renee Korn not to write any prescriptions. The original criminal complaint filed in October was dismissed Friday December 19 after the indictment — which allows prosecutors to proceed to trial without a preliminary hearing — was unsealed. The indictment alleges that Ray and the other co-defendants picked up multiple prescriptions for oxycodone, Xanax, Valium and codeine cough syrup during visits to Arnold’s clinic at 3756 Santa Rosalia Drive. After filling them at local pharmacies, members of the alleged drug ring resold the pills on the street between December 2012 and January 2013, prosecutors said. Police seized thousands of pills during raids on the suspects' homes, along with $10,000 in cash and more than 50 stolen identifications, according to prosecutors. At Arnold’s arraignment, his attorney, Jeffrey Rutherford told Korn his client had been a physician since 1966 and had no prior arrests. The defendants are due back in court Jan. 28 for a pretrial hearing. If convicted, Arnold faces up to 22 years in jail. The case is being investigated by the U.S. Drug Enforcement Agency, the California Medical Board and the Department of Health Care Services.